Once again the Titans soccer season came to an end in the first round of the 3A state tournament. After winning the Intermountain league title, the Titans earned the 23rd seed for the post-season and faced the 10th-ranked Salida Spartans in Denver on Friday, October 28, and while the Titan effort was valiant, they eventually fell to the Spartans 3-2. The game had everything one could ask for in a state tournament contest, with both teams facing elimination. There were two lead changes, several swings in momentum, coaches screaming, fans cheering, players bleeding and limping, a fracas on the goal line that resulted in two yellow cards and three corner kicks in the final five minutes, giving the Titans a last chance at forcing overtime. Yet, in the end, the chances flew wide and the Titans came up short. Confidence was high among the Titan players. 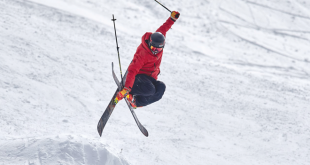 Oftentimes Crested Butte enters the post-season one of the final seeds and must face a Front Range foe of unknown ability in the first round. This year, the Titans had an idea of who they were playing, having faced Salida in the first game of the season, losing 3-0. 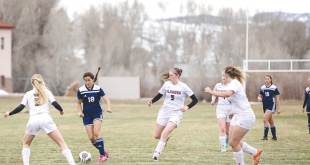 Since then Crested Butte spent eight weeks on a rollercoaster ride, ultimately finishing league play 8-3-1 to win the title and earn a spot in the tournament. Crested Butte was focused and composed prior to the game and well prepared for the showdown. But when the whistle blew, Salida came out firing, driving the play straight down the gut of the Titans’ defense, pinning Crested Butte for the opening 10 minutes. The Titans hung on as keeper Josh Pruett scooped up the through-balls and Tate Young and Alden Watkins cleared the ball from harm’s way, but Salida ultimately broke through in the 12th minute, hitting a shot from 25 yards out that slid under the crossbar for a 1-0 lead. Titan teams of the past would have folded, letting the game get away, but this squad was determined to show up this time at state. Down 1-0, the Titans started to surge with the defense finding targets with their distribution and Oliver Houseman and Dylan Eaton controlling the middle of the field. The harder Eaton and Houseman worked, the more the field opened for Noah Dumas, and Dumas worked hard to win the open field and find players on the flanks. The Titans stalled in the final third, but with pressure continued on Salida’s midfield, the Titans managed to challenge the Spartan defense. “They were playing harder, hustling to the ball and actually passing it to feet,” says Durgan. Jordi Nichols found an opportunity when a Salida defender misplayed a ball and Nichols pulled it away from two Salida defenders to find Dumas overlapping with a through-pass. Dumas took the pass and drove his shot low past the oncoming keeper to tie the game 1-1, 30 minutes into the match. “I felt like we had a lot of momentum and they started to realize they could compete with Salida,” says Durgan. The two teams traded off efforts the remainder of the first half and entered the break tied 1-1, leaving the game to be determined in the final 40 minutes. Crested Butte opened the second half where they left off, but Salida had regrouped to match the Titans’ intensity and an erratic opening 10 minutes ensued. Crested Butte broke the 1-1 draw 12 minutes into the second half when Dumas took a drop-pass from Nichols and drove a shot from 25 yards out over the Salida keeper and under the crossbar for a 2-1 Titans’ advantage. Salida played at an intense level all season long, battling against top programs each and every week, and they maintained their composure following the goal. Meanwhile, looking at a 2-1 lead, the Titans started to collapse on defense hoping to hold on. Salida took control of the midfield and started finding seams in the final third. Pruett came up with several big saves to hold off the attack, while Young and Watkins scrambled in the middle and Garret Pierson and Woody Martineau were solid on the outside, but Salida eventually found the equalizer midway through the second half. Five minutes later Salida struck again on a corner kick to go up 3-2, looking to bury the Titans for good. After a five-minute stretch of complete chaos from both teams, the Titans turned the ball back up-field and proceeded to go on the attack. Salida’s defense remained organized to shut off any open looks on net, but the pressure paid off as Crested Butte was awarded a corner kick with five minutes left to play. A header from Young was deflected wide on the first corner and the Titans lined up for a second corner kick. This time Eaton crashed the far post, and when the ball dropped in front of him he chested it toward the open net, only to have the ball headed wide at the last possible moment by a Salida defender. The third Titans’ corner kick also missed its mark and following the Salida goal kick the final whistle blew, leaving the Titans shy of a state tournament upset.